Was It All A Mistake, Or Just Good Luck? *In the kingdom of Dor, soup is loved and even honored with it’s own holiday. Serve soup for dinner while you enjoy the show. This could also double as an activity, by letting your family each choose a vegetable or spice for your soup or having everyone try to guess what ingredients you used. *Mice love cheese. Cut up some of your families favorites and have a platter full of cheese cubes that would stop Desperaeux in his tracks. You could even serve them with sword toothpicks from your local party store. *Roscuro is rewarded for being a “real rat” by getting to eat worms. Serve up some gummy worms as a snack during your movie night. *Boldo is a magic spirit of sorts, made from all the different ingredients of the chef’s latest soup. When he first comes on screen, pass out cut out pictures of vegetables from magazines (or print them from online or use vegetable stickers) to create your own version of Boldo… or get extra creative and use real vegetables. 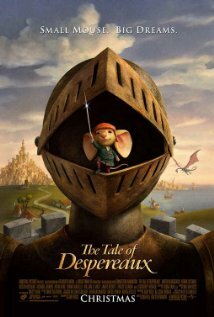 *When Princess Pea meets Despereaux, she makes him promise to finish his quest of reading the story of the knight and the princess. Take a moment to let everyone at your Movie Night choose a quest they want to work on. It can be something simple you want to accomplish right then, in the next few days or even months. What will YOUR quest be? *Miggery Sow wishes she were a real princess. As she imagines that she’s royalty she wears a crown she made herself. Make your own crowns by using foil and plastic utensils, or get fancy and creative with paper, gems, stickers and all sorts of craft supplies. *Throw your own Long Live Soup Day complete with vegetable hats. The movie says the festival was always on “The first Sunday in Spring…” but you could celebrate soup with your family anytime! *Read the Newberry Award winning book and see how it compares to the movie. You could even start a book club and make mouse tail bookmarks like this blogger did. *Despereaux has very uniquely big ears. Make headbands with large ears on them or print off these Despereaux masks and act out your favorite parts of the movie.